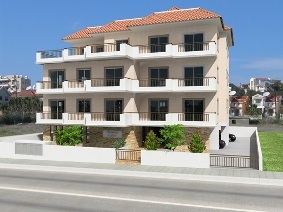 The building is an apartment block located in the residential and quit area of Ayia Fyla area with all facilities and amenities nearby, less than 10 minutes North of Limassol town centre. The project consists of 3 apartments with perfect functional layout and architectural study. a) At underground floor they are stores for each apartment. Every apartment has private parking place. b) Ground floor consists of one apartment of three bedrooms. b) First floor consists of one apartment of three bedrooms. b) Second floor consists of one apartment of three bedrooms.